Can The Country Dare to Dream Again? 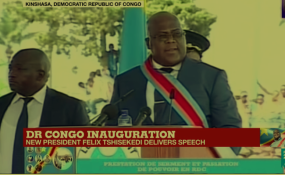 The inauguration of President Felix Tshisekedi. The world watches today as the country holds its first ever presidential handover ceremony. Since gaining independence from Belgium, political power in the Democratic Republic of Congo has always been taken through the barrel of the gun. In 1965 Joseph Desire Mobutu, then chief of staff, overthrew the president Joseph Kasa Vubu. Weakened by ill health, Mobutu was chased from power thirty years later by a rebellion led by Laurent Kabila in 1997. Kabila himself was assassinated by his bodyguard in a palace coup just four years later. His son and now the outgoing president took over and 18 years later has handed power to the first democratically elected leader Felix Tshisekedi, son of veteran opposition leader Etienne Tshisekedi who died in Belgium two years ago. The Congolese ministry of foreign affairs says seventeen heads of state were invited - all Africans - including five neighbouring countries: Tanzania, Central African Republic, Angola, Burundi, and South Sudan. Missing are neighbours Edgar Lungu of Zambia and Paul Kagame of Rwanda. The latter is also the current chairperson of the African Union. Both leaders expressed doubt at the outcome of the elections. The U.S. and other European countries were represented by their various ambassadors. The results in the presidential election published by the National Independent Electoral Commission and confirmed by the Constitutional Court showed Félix Antoine Tshisekedi Tshilombo won with 7 051 013 votes or 38.57%. He is followed by Martin Fayulu Madidi with 6 366 732 votes or 34.83%, and Emmanuel Shadary with 4 357 359 votes or 23.84%. Fayulu, however, did not recognize the outcome and called on his supporters to take the streets. Some European countries and even other African countries express doubts initially and called for a recount. The results were upheld and Felix Tshisekedi is now the new President of the Democratic Republic of Congo.